This dessert can also be served as a cream with fresh fruit such as apricots, peaches or nectarines, just don't put it in the freezer. Sweet biscuits such as langues du chats make a delicious accompaniment to both versions. 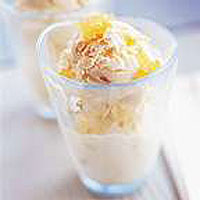 In a large bowl, blend the yogurt and orange curd together with the ginger and syrup. Reserve a little ginger for decoration. Transfer to an ice cream maker and freeze-churn until ready to serve. Or, pour into a freezer-proof plastic container, cover and freeze for 1 hour, then serve topped with a little finely chopped stem ginger.